Monday night at the Egyptian Theatre in Hollywood I saw the Rutles - no, not just the 1978 film "All You Need Is Cash" (though they showed that too) but the actual original foursome. As a huge Python/Rutles/Bonzos fan from childhood, I just about fell off my chair when I read the Rutles were back - the Pre-Fab Four! A legend that will last a lunchtime. A millstone in pop music history. The hilarious and musically spot-on Beatles parody band, which started as a sketch on an Eric Idle post-Python TV series, has strangely taken on a life of it's own with a series of Rutles tribute shows in LA and New York featuring Beatles impersonaters The Fab Four covering Rutles songs, mixed with video clips and live theater - yup, not the real Rutles but an incredible simulation. A bit confusing, isn't it? As the ads say, "Nostalgia for something that never existed." Rutlemania! Through the 21st in Hollywood, then 4 more shows in New York. "I Must Be In Love" - complete with the screams of Rutlemaniacs. "Children of Rock'n'Roll/Startime" - 50 seconds or so of what would later be "See How The Good Times Roll." "Accountancy Shanty/Football" - Years before it's appearance in the 1983 Python film "The Meaning of Life," here's the original pirate's shanty about high finance on the high seas, then a goof on soccer/football 'ooligans. "Communist Cooking"/"Johnny Cash Live at Mrs Fletchers"
"24 Hours in Tumbridge Wells/The Fabulous Bingo Brothers/In Concrete" - parodies of: the Sinatra/Gene Kelly musical "On The Town," aged vaudvillians, modern rock. "I Give Myself To You" performed by the Alberto Vascetomy Singers. "Song O' The Insurance Men/Closedown"
And more HERE, courtesy of the I'm Learning To Share blog, including the Stevie Wonder-goes-to-the-laundromat funk of "Front Loader," and the new disco move "The Hard To Get." 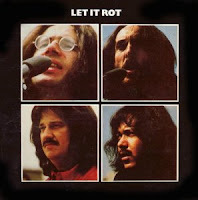 And surviving members of the Bonzo Dog Band released a reunion album last December, but that's for another time. Ouch! I now have ticket's and I am going to be there friday! do you know that someone uploaded the whole RWT series 1 and 2 onto torrent? Suspiciously high quality AND have the colour bars and count in, hmm. 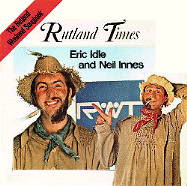 Given that apparently Eric Idle never wants to release them, I think someone has leaked them intentionally.